Barcelona, the most northeasterly province in Catalunya (and Spain) is best known for it's capital city. It does however have an important coastline, south of the capital lies the Costa del Garaff, often included together with the northern end of the Costa Dorada (as we do on this website). Probably the best known resort on the Costa del Garaff is Sitges, with it's 22 beaches. However there are many, often wide sandy beaches, on this stretch of coastline, popular with local people as they are very accessable from the city by train. To the north of Barcelona city lies the Costa del Maresme, often included (as we have on this website) with the well known Costa Brava. Here again you will find wide sandy beaches popular with those that live in the city, as are the beaches of Barcelona itself. Although Barcelona province doesn't touch the French border, it does include a chunk of the Pyrenees and a ski resort, Rasos de Peguera. 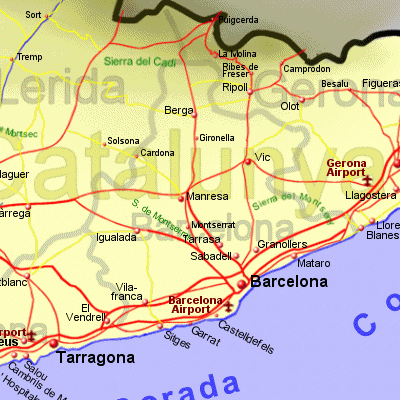 The area is very accessible from Barcelona City via the C16 road via Manressa and Berga. Although there is not a train service to this area, the route via Vic to Ribes de Freser in Gerona province, from where there is a rack railway to higher levels. Approximately 50Km north west of Barcelona city lies the Monserrat mountains, a jagged ridge with peaks rising to over 1200m, part of the Park Natural de Muntanya de Montserrat. At the eastern side of the park lies the famous Santa Maria de Montserrat Benedictine Abbey, an important religious location and tourist attraction. This too can be reached by train from Barcelona city. Barcelona benefits from the High Speed AVE service from Madrid which will eventually be extended up the coast to France. The fast Euromed train currently runs on the coast line to france and down to Valencia and Alicante.